Patients should understand the importance of folic acid, iron, calcium, and omega-3s in pregnancy. Eating a healthy, balanced diet is the best way of getting the vitamins and minerals that your body needs to stay healthy. If you are planning to conceive a child or if you are already pregnant or breast-feeding, you need higher amounts of certain nutrients for both your health and the health of your baby. Prenatal vitamin and mineral supplements will help you get all the nutrients that you need during this important time in your life. Prenatal vitamins are nutritional supplements. They contain key nutrients that women need when they are pregnant, trying to get pregnant, or breast-feeding. These include folic acid (a type of B-complex vitamin), calcium, iron, and docasahexenoic acid, or DHA (an omega-3 fatty acid). Prenatal supplements can also include vitamins C, D, E, and other B vitamins, as well as minerals. Prenatal vitamins are an important part of pregnancy nutrition. They should be used together with a healthy, balanced diet. Results from some studies suggest that prenatal vitamins may actually decrease the risk of low birth weight. Many health care professionals would agree that you should begin to take prenatal vitamins at least 3 months before you try to get pregnant. This is because folic acid can help prevent neural tube defects, which are birth defects that can develop in the first 28 days after conception. If you are trying to get pregnant, you should discuss this issue with your doctor. It’s best to take prenatal vitamins throughout your pregnancy. Your health care provider may also recommend that you continue to take prenatal vitamins after the birth of your baby, especially if you plan to breastfeed. How Are Prenatal Vitamins Available? Prenatal vitamins are available as pills, capsules, chewable tablets, and even liquids. Your primary health care provider will probably suggest a specific brand of prenatal vitamin supplement. They are available both with and without a prescription. You should always select vitamin supplements from a reputable manufacturer and inform your primary health care provider of all medications (prescription and nonprescription), including other vitamins and minerals, that you are currently taking. Make sure that you do not take any other vitamin or mineral supplements while taking prenatal vitamins unless your primary health care provider recommends it. How Do I Take My Prenatal Vitamins? In general, prenatal vitamins should be taken on an empty stomach with water. If you experience nausea while taking your prenatal vitamins, take your vitamin at bedtime and with a light snack. If you experience extreme nausea, immediately consult your primary health care provider. 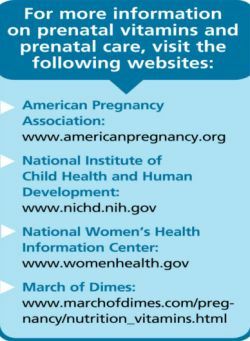 Always discuss any concerns with your primary health care provider or pharmacist and maintain routine prenatal visits throughout your pregnancy.